These Chicken Flautas are a great dinner if you don’t have a lot of time but still want a family-pleasing meal. I love dipping these in sour cream or salsa! Chicken Flautas are surprisingly filling and one batch goes a long way. It can feed a family for dinner or you can freeze/refrigerate for snacks throughout the week. Little kids will only eat one for a snack after school, but teenagers will eat a lot more! It’s a much better after school snack than if my kids went for something loaded with sugar. With all the cheese and chicken inside these are loaded with protein. 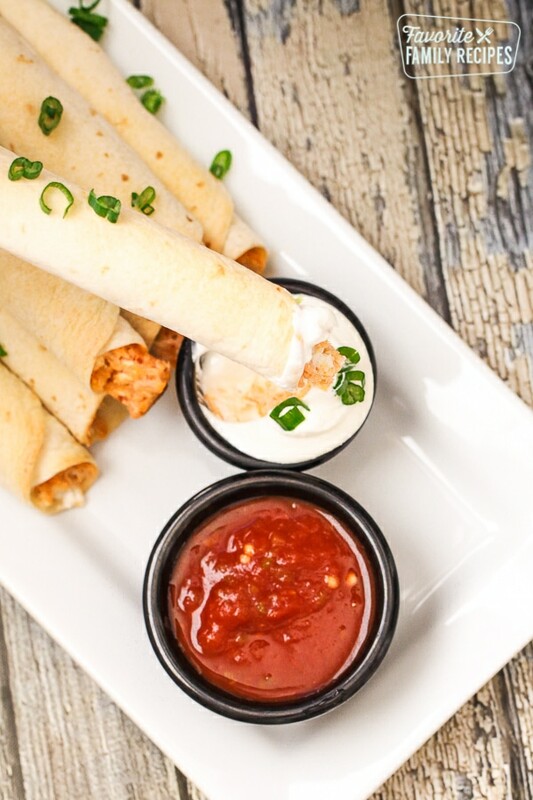 We love dipping Chicken Flautas in sour cream, salsa, guacamole, and/or ranch dressing. Chicken Flautas are also a great game day food. They can be eaten with your hands and they aren’t messy. I like this recipe for using up leftover chicken. It can also be made up even quicker with canned chicken. Check out the video below to see how easy these are to make! This recipe reminds me of the Chicken Flautas you can buy pre-packaged at Costco. They are convenient to purchase already made, but there are some advantages to making your own at home. First, making your own are definitely a healthier option. These Easy Chicken Flautas are baked, not fried. You can also use a variety of tortillas if you are trying to cut back on calories or have a gluten allergy. 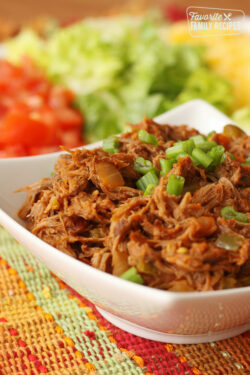 Corn tortillas, whole wheat tortillas, and low carb tortillas can all be used in this recipe. Second, making your own at home is more economical. The last time I looked at my Costco, a package of 16 flautas cost $9.49. You can make a lot of flautas at home for that amount! We have some other EASY Mexican recipes that I would highly recommend if you like our Easy Chicken Flautas. I use our Restaurant Style Refried Beans and our Restaurant Style Mexcian Rice for side dishes every time I make Mexican food at home. We honestly never make a Mexican dish without these two sides anymore. Some of my other favorite Mexican dishes are our Carne Asada Burritos and our Honey Lime Chicken Enchiladas. These Chicken Flautas are a great dinner if you don't have a lot of time but still want a family-pleasing meal. I love dipping these in sour cream or salsa! 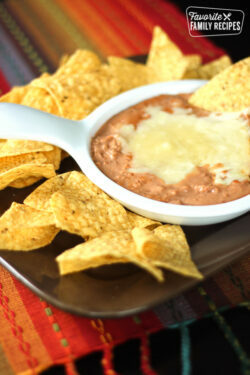 Combine chicken, cream cheese, Monterey Jack cheese, salsa, and salt & pepper in a medium-sized bowl. Mix together well. Evenly distribute chicken mixture over each tortilla, making a line down the middle of each tortilla and then rolling them up tight. Line a baking sheet with aluminum foil and spray with cooking spray (or use a silpat). Place rolled up tortillas evenly spaced on the cookie sheet (seam side down) and spray cooking spray generously over the top. Bake for 10-12 minutes or until tortillas become golden-brown. Yum. I’m making these for dinner tonight. I made these on Sunday during halftime of the Houston Texans game (since my family ate all the Cheese Steak Crescent Rolls before the game). BIG hit! I made a double batch so we could eat them for snacks and/or school lunches this week. And they were all gone today! Thanks for another great recipe! I made these last night. They came together so fast!. We loved them, and needed something easy during the holiday season. I served them with a green salad, and they were perfect. Thanks. Made these for the first time tonight and they were a huge hit! I love how quickly I could put these together, and how tasty they were! Thank you! Made these tonight and they will certainly be going into our rotation for dinners. They went together real quick and tasted oh so good. How did it go?! I was thinking about going with a similar plan for my ex boyfriend! Does the oven cook the chicken? Or do you boil it or something first? Definitely used pre-cooked, pre-shredded chicken. You can boil it or bake it first. Whichever you prefer. 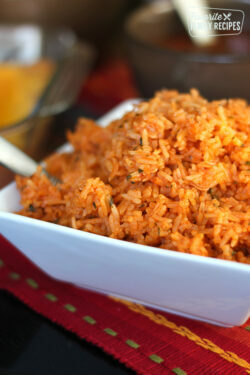 Just make sure it is fully cooked and shredded before adding to the recipe! I’m cooking my chicken in the crock pot with a tsp of cumin and will shred it myself later. This was delicious! Thank you so much! 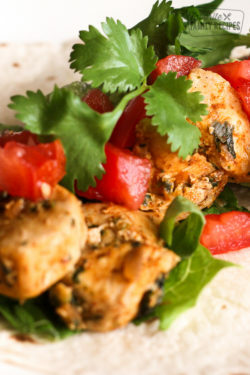 Can I use Pita bread instead of tortilla wrap. If not hopefully u can post a recipe using Pita bread. Great idea! I’m glad you like the recipe! I found your recipe recently via Pinterest and have made it so many times since. My family and I love them! They freeze so well too. Thanks! Hi Sarah! Did you freeze final product or mix? Do you freeze them after already wrapped up in the tortillas? Or just as the prepared chicken mixture? Will Corn tortillas work just as well? YOu can use corn tortillas and fry them.. but that would make them a taquito 🙂 Yes, they are very delicious that way! Would you use all the ingredients as above if I use corn and fry them? Love these! I have made them several times and featured them on our blog! They freeze well and are a great go to meal from my freezer on busy days! Thanks for the great recipe, as always! Hi! Did yoy freeze mixture or final product? Thanks! This is great to know they’re a hit w my baby girl! I am hispanic, when you say flautas, I think corn torillas, flour tortillas to me are for eating, and burritos. Ty for sharing . These are amazing! And as a Mexican born in Mexico, raised in California, when you say flautas it definitely means flour tortillas. Like you said, corn tortillas make them taquitos! : ) Either way, so bomb! Thanks for the recipe! So glad I finally get some back-up on this 😉 Thanks! Can you make these without the cream cheese? Sure, I just can’t promise they will taste the same! Does anyone know what the calorie count is? Can you substitute sour cream for the cream cheese? I’m trying to avoid a trip to the grocery store! ???? that should work, the flavor will be different though. What is the ‘sauce’ you dip these in? We usually dip it in salsa and/or sour cream. What you see pictured is salsa 🙂 Hope this helps! I would like to know if these are best frozen before they are baked? Should you bake these first before freezing? I am making approximately 60 to 70 for our church children’s summer camp. You can definitely freeze them before baking.. but if it were me, I would probably bake them first unless you can flash freeze them (so they don’t get soggy). Either way would probably work fine. 🙂 Hope this helps! For us ‘eaters’ here in Oz, tell me what Monterey Jack cheese is? It is a white cheese similar to texture as mozzarella but typically used in Mexican dishes. Do you have pepper Jack cheese there? It is pepper Jack without the peppers! Absolutely! Cheddar cheese would be every bit as good. Thanks for asking! Wow, these look SO good. Our local takeout Mexican food place offers 3 chicken flautas for $4.95 and by the time I get home they are nearly cold. Watched the video and realize I can make them at home. Cannot wait to try these at home. Thank you so much for posting. Hi Karen! So excited for you to try them! We almost never buy them anymore because they are just SO easy to make AND you can make them healthier because they are baked instead of fried. Let us know what you think when you try them! What would you constitute as a flauta?